Brand new and built of steel, the French Polynesia Master is the newest liveaboard to ply the waters of this island archipelago, welcoming aboard 25 guests for 7 or 10 night dive safaris. The four decks provide ample space for relaxation, dive equipment and camera preparation. There are 13 twin bed / double-bed cabins for up to 25 guests (2 cabins on the main deck are fixed twin, all other cabins are convertible twin/double). Each has a/c and is en-suite. The main deck has a spacious indoor salon with aircon and plasma screen for movie and photo viewing as well as numerous charging points and storage. The upper level has spacious outdoor dining and a shaded outdoor relaxation area, as well as forward sun loungers. The upper deck also has a Jacuzzi. The vessel has 3 large dive tenders and a maximum 5 guests per dive guide. Diving is at the rear of the upper deck in a dedicated shaded outdoor seating area. Dive equipment is set up and stored on the rear of the main deck. All guests are allocated an individual set up station, with under bench storage for masks, fins and other personal items. A camera table can be used to store prepared equipment ahead of the dive, with dedicated rinse tanks provided. Divers can take advantage of the on deck shower hoses or use the port side deck heads to rinse off between dives. Open Water and Advanced Open Water divers (or equivalent) are limited to 30m maximum, regardless of whether you carry the Deep Diver Specialty. Rescue Divers and above are permitted beyond 30m/100ft to a maximum of 40m. Please note that there are regular checks by the local authorities that these limits are being adhered to. Hence, the guides will be very strict with implementing them. Boat Only price per person includes: transfer between internal airport and boat, full board basis on board for 7 or 10 nights (including local beer and soft drinks, in a twin lower deck cabin, air, tanks, weight belt and weights. 18-20 dives (weather permitting) on a 7 night itinerary and up to 30 dives (weather permitting) on 10 night itinerary, 12lt cylinder, weights and a land visit. Dive training courses aboard the French Polynesia Master cannot currently be offered. Diving Rangiroa’s reefs and channels you can expect to see grey reef hammerhead, black tips, silky, tiger and silver tip shark species cruising the reef, hunting on schools of snapper and fusiliers. Whilst drift diving through the 1200m wide channel at North Fakarava Island, you can experience incredible shark action, see huge Napoleon wrasse and witness marbled groupers spawning. A typical diving day will see you cruising through channels and exploring the outer reefs of the atolls, yet there are numerous of shallow dive sites within the Tuamotu Archipelago, each with stunning hard corals, sheltering all manner of crustaceans and molluscs. Water temperature ranges from 26°C (79°F) in the winter and 29°C (84°F) in the summer. Most guests find that a 3mm shorty and possibly a rash vest are suitable for the water temperature. However, for guests who feel the cold easily, especially with repeated diving, then we recommend to bring an extra vest / hood or full wetsuit. In short bring what you feel most comfortable in. Tiputa Pass – Dropping in at the outer edge divers can hook in to the reef wall and watch the amazing shark display. Hammerheads, tiger shark and huge schools of grey reef shark are the main draw. Drift on the incoming tide through The Canyons, where schools of big eyes hang out and mantas can be seen hanging in the cross current. End the dive at Shark Cave where white tips typically come to rest. Other common fish species are grouper and Napoleon wrasse. Tiputa Reef – On the ocean side of the pass the reef plateaus out at 20m into a magnificent coral garden. Schools of barracuda, turtles, white tip sharks, small wrasse and many colourful reef fish species can be seen. Mantas put in an occasional appearance, bottle nose dolphins too. Deep Blue – Or simply “The Blue” is the deep water on the ocean side of Tiputa Pass. Here we drop divers directly from the boat to descend to 20m and hang in the blue as the sharks are tempted up to the shallower depths by dropping stones. Expect to see grey reef, silky and silver tip sharks as well as bottlenose dolphins. Nuhi Nuhi – A shallow coral garden where angel fish, butterfly fish, anthias and all manner of small creatures can be spotted. Look out for leaf fish. Garaue Pass – The northernmost channel of Fakarava Island and arguable the best site in the region for consistent shark sightings. The pass itself is 1600m wide and should only be dived at slack water due to the very strong currents. Starting at the outer wall we encounter the huge “wall of sharks” where hundreds of greys congregate. Black tip, white tip, hammerhead, tiger, silky and oceanic white tip are amongst the other species seen. Napoleon wrasse, surgeon fish and the typical schools of big eyes and yellow snapper swarm over the reefs, joined by turtles, morays and lionfish. In June and July, large numbers of grouper aggregate to spawn, a truly spectacular sight. Manta rays also visit. Tumakohua – The southern pass of Fakarava is just as dramatic as the north, though only 200m across, it can be dived with both incoming and outgoing tides. Big schools of grey reef sharks can be seen in the deeper water whilst along the shallower reef black tips dart about. Manta rays and leopard whiprays are also frequently seen. Maiuru – A submerged plateau on the outer edge of the pass, levels out at 18m into a lovely hard coral garden. At the ‘drop off’ you can encounter shark activity, whilst over the reef paddletail snapper and barracuda form large schools. Manta rays and eagle rays come by for cleaning and a quick meal and there are plenty of smaller creatures including nudibranchs and crabs to spot amongst the corals and sponges. Ohutu – The second plateau starts at 12m and drops to 30m with vibrant corals this is a superb place to watch manta rays. Restaurant Pier – This shallow site is perfect for an afternoon dive where schools of snapper, black tip reef sharks and Napoleon wrasse are common with a stunning atmosphere for photography. Tehere Pass – The strong currents through the pass mean divers can literally hang like a flag in the breeze! Reef hooks are essential if you want to stay and enjoy the hundreds of grey reef sharks hunting on fusiliers. Tuna, dolphins and swordfish can also be seen. The seabed and wall is more rubble than coral reef so simply drift in the current and enjoy the large pelagics. Otugi Pass – The 400m wide channel is best dived on an incoming tide for the schools of grey reef sharks and silvertips. Teahuroa – The outer reef wall is where huge schools of snapper congregate. Reef sharks, Napoleon wrasse, barracuda, surgeon fish and big eyes join them, whilst manta ray sightings are possible too. Tuheiava Pass – A channel dive providing predictable encounters with grey reef and white tip reef sharks, schooling snappers in huge numbers and dolphins. Turtles and solitary barracudas are also seen. The Shark Hole – Diving down a vertical break in the reef brings you through schooling sharks onto even bigger schools of snapper. The archway at 50m is adorned with anemones. The Old Pearl Farm – Is the place for watching mantas as they come to the reef for cleaning. Outer Wall – The sloping outer wall of Kauehi Island is encrusted with huge hard coral formations and sponges. Butterfly fish, surgeon fish, banner fish and snappers all form large schools over the reef. Puffer fish, morays, tuna, barracuda, wrasse and lionfish are a common sight, whilst mantas, grey reef shark, eagle rays and the occasional hammerhead make up the larger visitors. Great for spotting leaf fish and nudibranchs. Tairapa Pass – Drift through the shallow channel at incoming tide for a spectacular view of reef sharks, Napoleon wrasse, manta rays and eagle rays. Jacks, triggerfish, moray eels and grouper are also amongst the common visitors. The Circus – Dependent on currents this is a superb spot for consistent sightings of manta rays. Wathc as the graceful mantas come for feeding and cleaning. The visibility can drop to just 10m due to the plankton rich waters. The Drop Off – On the Southwest of the Tairapa Pass this stunning wall drops to over 1500m . We of course don’t dive that deep! Staying at an average of 20m we encounter many white tip, black tip and grey reef sharks, large schools of tang and triggerfish and plenty of snappers. West Point – This gentle dive with less current than at the channels, great for turtles, black tips, barracudas and groupers. 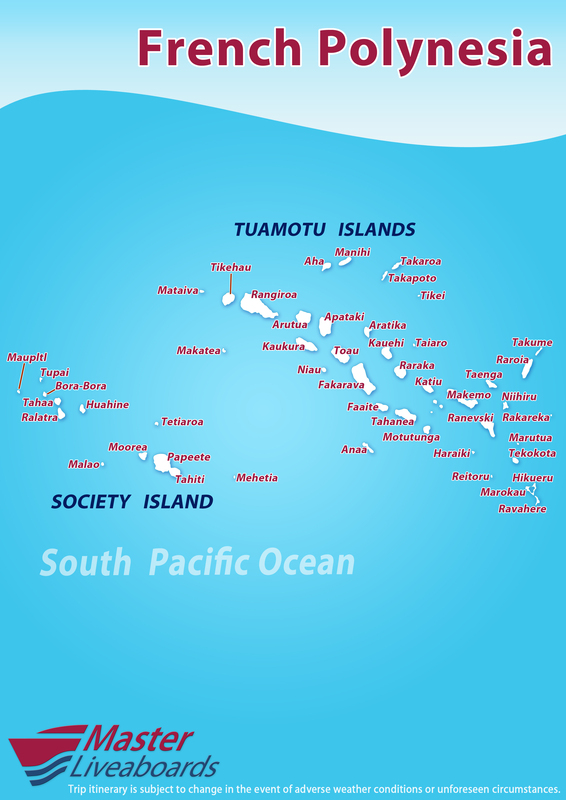 French Polynesia is accessed through Tahiti via Paris. Flights are with Air France, but are not daily, so at least one overnight is needed at the beginning and end of the liveaboard itineraries. There are daily domestic flights between Tahiti and Rangiroa and 6-7 times per week between Tahiti and Fakarava (depending on the season), which are only around 1 hour in duration. Disembarkation at the end of the cruise will be just before 10am. If you are not remaining in French Polynesia for additional nights after your cruise, please allow plenty of time for the transfer to the airport and for check-in. Time zone: The local time is 10 hours behind UTC (GMT). Please note that the Air France flights operate via Los Angeles (LAX) both ways. All passengers travelling via the US need to complete an ESTA. This must be done online in advance of UK departure. If you are travelling via the USA,Visa Waiver Programme (VWP) allows most British Citizen passport holders to visit the US for up to 90 days. The types of journey allowed under the VWP include tourism, certain types of business visit and transit to another country. French Polynesia is a set of islands that is an overseas country attached to France located in the South Pacific Ocean. British passport holders only need a valid passport for entry.. Please make sure that your passport has validity of at least 6 months beyond the period you intend to stay in French Polynesia. If you are travelling with medication please ensure to bring your physician's prescription with you. Always check for last minute changes in entry requirements at the Foreign & Commonwealth website: www.fco.gov.uk Nationalities other than British citizens should check with their own consular office. If travelling from the UK, there are no compulsory vaccinations for travel to French Polynesia, but we always recommend protection against typhoid, tetanus, hepatitis A and polio.